Hello everybody! 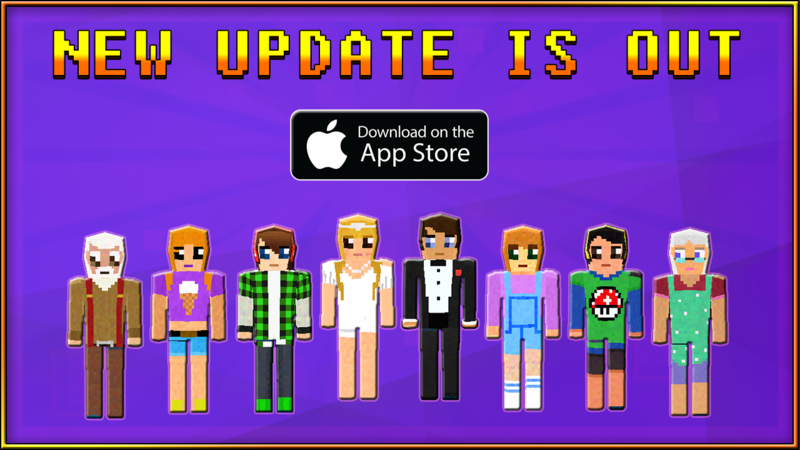 The long waited v3.2 is now available on Apple Store! - New amazing skin pack - FAMILY! Choose your role and create your own family in Multiplayer mode! - Added localization to Russian and German languages! You can switch different languages directly from the main menu! - Optimized 3d game performance and multiplayer server speed! Enjoy and please give us a good feedback to new v3.2! "Optimized 3d game performance and multiplayer server speed!" I guess at least this version still got an update. I mean afterall, with World of Cubes, Planet of Cubes, WorldCraft2, Planet Survival Multiplayer, and all non-Minecraft related Solverlabs Limited games being tooken off the Google Play Store (leaving only WorldCraft for WoC and PlanetCraft of PoC to remain on the Play Store), and then having the WoC Forums super inactive (it's been a ghost town for the last two years, since PoC dominated the Solverlabs community),and having Pocadimin suddenly disappear for a month or two, thus causing the PoC Forums to slightly decrease in activity, I expected that Solverlabs was no more. I didn't expect this update, and despite pretty much being just a texturepack and nothing else, when this game needs more basic improvements(such as grass spreading on dirt, shears collecting leaves and tall grass, saplings, water, and countless other things), I'm still grateful for this update if this means that the admins could start being more active/ more interactive to the game's community, and also actually moderating and enforcing forums rules, as at this point over the past two years, pretty much everyone has broken at least one rule on the PoC Forums. Basically I don't like how the company's forum admins just disappear with no warning for weeks or even months at a time, and when they do return, it's usually to only announce an update, poll, or forum event, which is one of the rarest things to occur on the forums, next to Hakuin visiting the forums, and GHE having a legit loss of some kind. Also I'm concerned about how there's forum rules that are never enforced, then again I don't blame Pocadimin so much about it, as a lot of the people who actively brake more rules than others also tend to have VPNs or something similar, making them un-banable with the current systems of the forum sites. Though I do understand that Solverlabs is a small company, who's always busy giving out updates every month or few, to even one time a year back in 2014-2015, but there needs to be a active admins that both interactive with the community, and inforces on the set forum rules. ιтѕʝυѕткαтуα, wait, you're saying they got rid of the default red shirt skin? BlueTangs Rock2, No Not Necessarily, It's Still There I didn't mean it in that way, So sorry for the inconvenience. funnyjokes wrote: Really your post is really very good and I appreciate it. It’s hard to sort the good from the bad sometimes.You definitely put a new spin on a topic thats been written about for years.